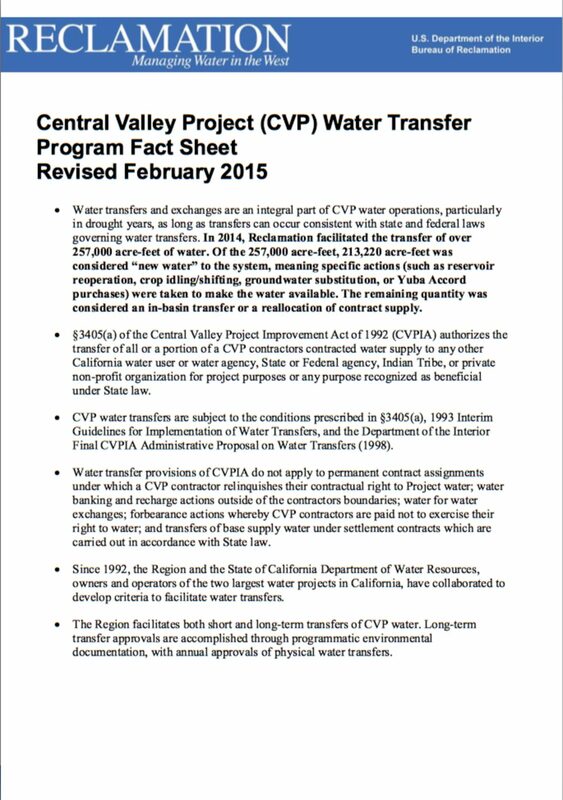 Reclamation fact sheet on the Central Valley Project water contracts. 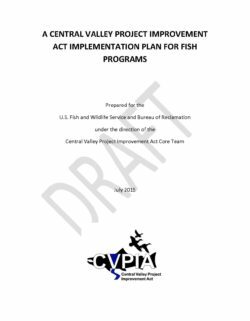 The Bureau of Reclamation (Reclamation) prepared the Central Valley Project (CVP) Municipal and Industrial (M&I) Water Shortage Policy (WSP) Environmental Impact Statement (EIS) to evaluate the potential impacts of CVP M&I WSP alternatives. A Record of Decision was signed on November 13, 2015, to implement Alternative 4 (Appendix A), Updated M&I WSP (preferred alternative). Define water shortage terms and conditions for applicable CVP Contractors. Determine the quantity of water made available to CVP Contractors from the CVP that; together with the M&I Contractors’ drought water conservation measures and other Non-CVP water supplies, would assist the M&I Contractors in their efforts to protect public health and safety (PHS) during severe or continuing droughts. Provide information to Contractors for their use in water supply planning and development of drought contingency plans. After five years of drought, rain and snowstorms in Northern and Central California in the winter of 2016-2017 significantly improved water supply conditions in the state in 2017. According to the U.S. Drought Monitor, as of late April 2017, less than 1% of the state was in severe drought conditions. This represents an improvement from one year prior to that date, when 73% of the state was in severe drought conditions, and two years prior, when 92% fell under this designation. Stress on water supplies due to drought resulted in cutbacks in water deliveries to districts receiving water from federal and state facilities, in particular the federal Central Valley Project (CVP, operated by the Bureau of Reclamation) and the State Water Project (SWP, operated by the State of California). In 2015, California mandated a 25% reduction in water use for nonagricultural water users, and overall SWP deliveries were limited to 20% of contractor requests. Some of these restrictions have since been relaxed. 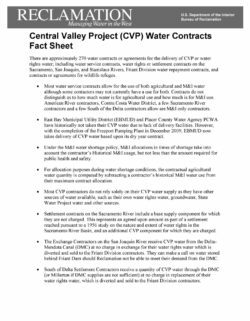 Reclamation estimated its initial water allocations for CVP contractors for the 2017 water year in a series of announcements in February, March, and April 2017. For the first time in years, initial water allocations for most CVP water contractors were 100%. Contractors south of the Sacramento and San Joaquin Rivers’ Delta (Bay Delta) initially received lower allocations in March 2017 (65% for agricultural contractors and 90% for municipal and industrial contractors, respectively), but Reclamation subsequently revised these allocations upward to 100% in April. The allocations represented a drastic change from recent years, in which no supplies were made available to many of these contractors, who farm some of the most valuable irrigated agricultural land in the country. Most expect that the historically wet conditions of 2016-2017 will not continue in future years and that future water years will continue to see deliveries limited to some extent. 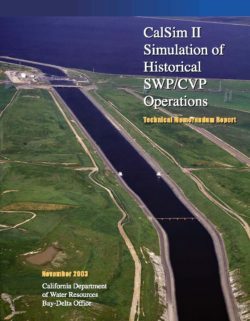 Previous cutbacks to CVP deliveries (in particular during periods of increased precipitation) have caused some to criticize Reclamation’s management of the CVP and question the extent to which factors beyond limited water supplies (e.g., restrictions to protect endangered species and water quality) influence water management and the quantity of water delivered to contractors. They argue that congressionally directed changes in the operation of the CVP that would result in increases to water allocations are needed. Other stakeholders argue that some of these changes could undercut environmental regulations, harm fish and wildlife, and potentially lower water quality. They also worry that legislative proposals that would alter the implementation of the Endangered Species Act could harm species in the region and set a precedent that could be used to affect other listed species in the future. 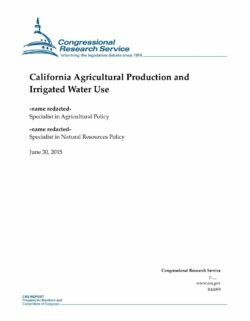 Legislation enacted in the 114th Congress (Subtitle J of S. 612, the Water Infrastructure Improvements for the Nation [WIIN] Act) incorporated provisions from multiple California drought-related bills that had been considered dating to the 112th Congress. Among other things, these provisions directed pumping to “maximize” water supplies for the CVP (in accordance with applicable biological opinions), allowed for increased pumping during certain high water events, and authorized expedited reviews of water transfers. Similar to recent congresses, the 115th Congress is considering legislation that proposes additional changes to CVP operations. H.R. 23, the Gaining Responsibility on Water Act (GROW Act) incorporates a number of provisions that were included in previous legislation but were not in the final version of the WIIN Act. Congress may consider this and similar legislation, as well as oversight of CVP operations and implementation of WIIN Act CVP provisions. This report provides an abbreviated background on the CVP and SWP. It also provides a summary of recent hydrologic conditions in California and their effect on water deliveries. 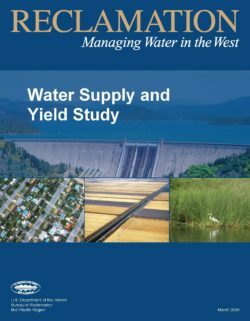 Bureau of Reclamation (Reclamation), to conduct a study of available water supplies and existing and future needs for water in the State of California. 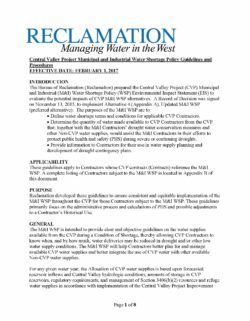 The Secretary is to prepare a report identifying possible projects and water management actions that could provide new firm yield and water supply improvements for the CVP. 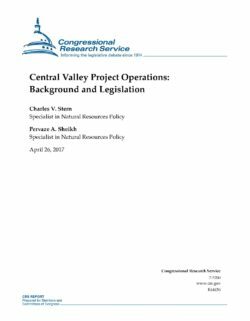 The Secretary is also required to incorporate and revise, as necessary, the results of the 1995 Least-Cost CVP Yield Increase Plan originally required by section 3408(j) of Central Valley Project Improvement Act (CVPIA) of 1992. 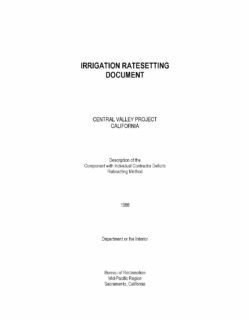 The purpose of this document is to present the procedures and methodologies utilized in calculating water rates for the Central Valley Project (CVP) under the Component with Individual Contractor Deficits Ratesetting Method and to provide a brief history of the CVP and the different ratesetting methods that have been utilized since its beginning. 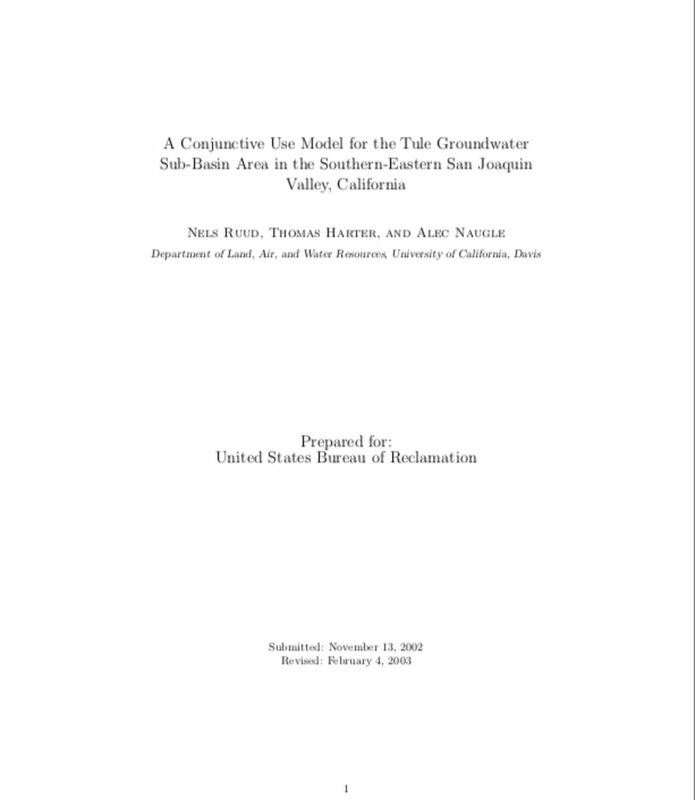 Also included is a description of the cost allocation procedures used in the CVP, a description of many of the premises included in the ratesetting method and a detailed description of the procedures utilized in computing water rates under the Component with Individual Contractor Deficits Ratesetting Method.